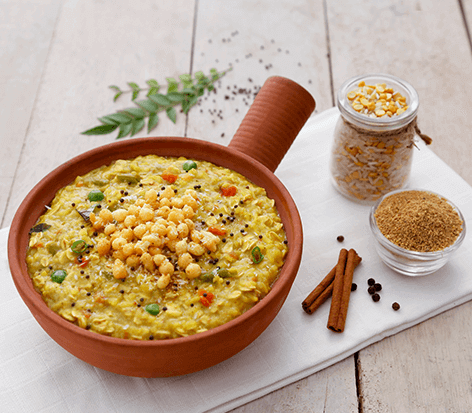 Healthy twist to most loved Karnataka delight. Wash & soak rice and dal together for 10 mins. Dry roast all the spice mix ingredients in a pan for 2-3 min. Cool and grind. Heat oil in a pressure pan , add mustard and curry leaves. Splutter. Add in chopped vegetables and sauté for a min. Mix in soaked rice & dal. Add 2 cups water, turmeric & salt and pressure cook for 4-5 whistles. Mix together coconut, jiggery, tamarind and bisi bele bhaat powder in ¼ cup water and add to the cooked rice dal mix. Add in ½ cup oats and cook without lid for another 2 mins . Cover and keep aside for 5 mins for the flavors to blend . Transfer in a bowl , top with some boondi & Serve.